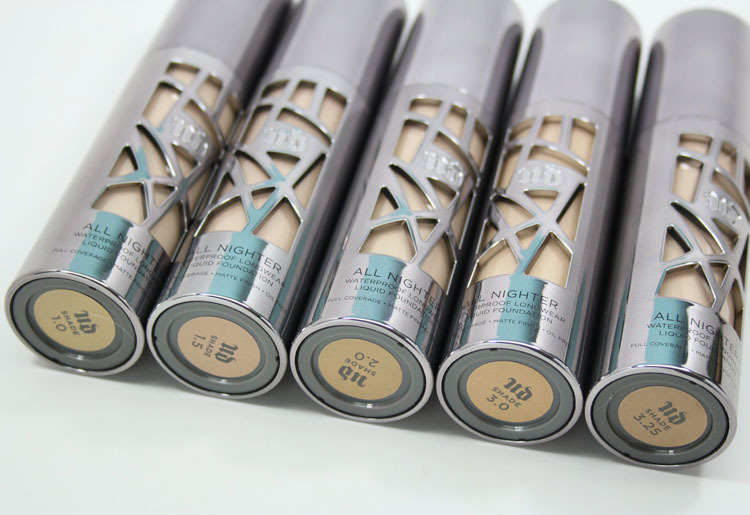 Urban Decay All Nighter Liquid Foundation was just released for fall 2016 and I’ve got my thoughts and some swatches of shades for you. 1.0 is the second lightest shade and is a fair bisque with soft warm undertone. 1.5 is a fair bisque with subtle pink undertone. 2.0 is a fair with soft warm undertone. 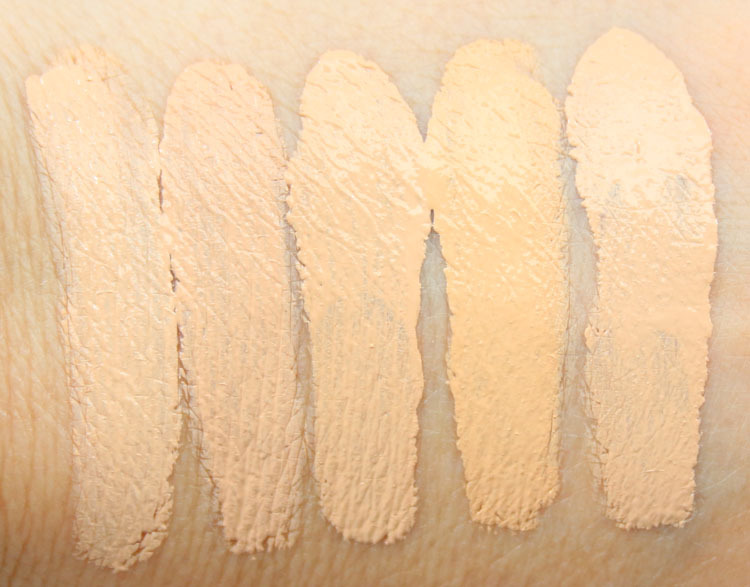 3.0 is a light with soft warm undertone. 3.25 is a light with neutral undertone. I am still on the fence whether my shade is 3.0 or 3.25 (still trying them both out on my face currently), but the other three here are definitely much too light and/or pink for me. I *think* 3.0 matches me better. As you might already know, I never wear a full coverage foundation. I don’t really ever even wear foundation much anymore. My go-to product since it came out is Naked Skin One & Done because I don’t like a ton of coverage. This stuff is very pigmented and a small amount covers a lot of area. It certainly blurred out pores and other little dots and spots without a primer underneath and blends pretty nicely. It’s easier to use something like a beauty blender or a brush rather than fingers with this since it’s thick. The finish is matte, but not like a SUPER dry matte. But definitely matte. Personally I don’t love this foundation simply because I am not into full coverage. It doesn’t feel heavy or look like a mask or anything, it’s just that I feel like I look younger and better nowadays when my real skin pokes through and I have some sheen/shine on my face. Matte isn’t really your friend as you age, and around my eyes especially I think this settled a bit, and made me look more “wrinkly”. But if you love a full coverage or are younger and can pull it off the finish, you might love this foundation! You can find this now on the Urban Decay site and it’s $40.00 for a 1 oz bottle. Thoughts about this? Are you a full coverage person or no? Thanks for such a great and detailed review. I think I might like this for shoots and summer time because my face sweats a ton in the humidity which I hate so this might actually stay on! I’m always looking for a better full-coverage foundation and there are just not that many good ones. Estee Lauder Maximum Cover is great but a little TOO heavy. Right now I’m using a BB cream from Lioele, but it will be too dark in the winter when my tan fades. The Korean-brand BB creams have heavier coverage than the American ones and Lioele is great. They are definitely different with different undertones. 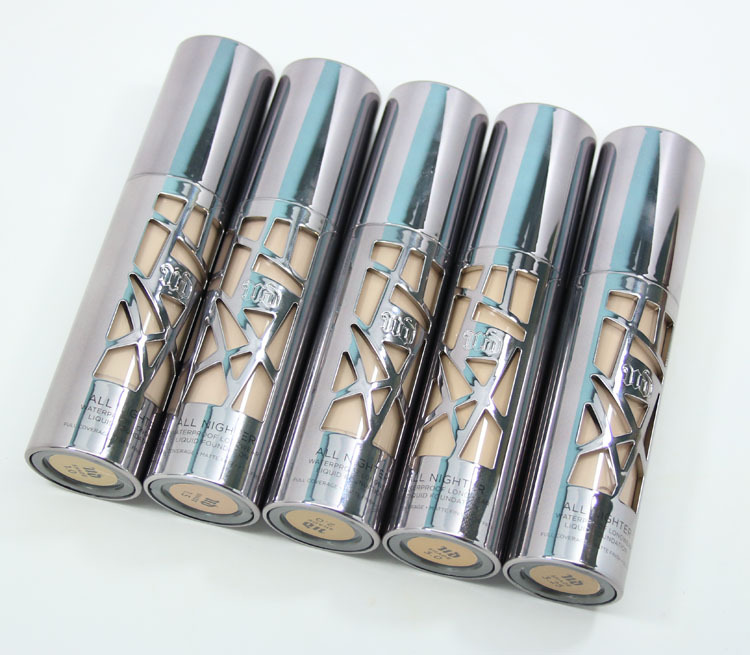 By the swatches alone I can tell that these concealers are no joke! It’s promising that they seem to go on well without a primer, though, and the coverage could even mean skipping concealer. I wonder how it would hold up on oily skin in this summer heat? I’m quite set on getting the foundation. My only issue is the shade selection. I usually go for light beige/light warm shades and judging from the name only, 3.25 seems good, but the swatches look kinda pale. Swatches of 4.0 that I found look super yellow. Do you have any shade comparisons for shades 3.0 and 3.25? Thanks in advance!! I swatched 3.0 and 3.25 in the post, not sure what you mean? I don’t have them compared to other foundations, no. I just meant that in my own research, I found other bloggers who had shade 4.0 swatched. I guess it’s probably best to head to a Sephora and test them out. Besides, in this crazy heat, I’m not sure if I would want to have it shipped over. The lightest one you show is way too dark for me. Their .5 in Naked isn’t too bad but it oxidizes and gets chalky 🙁 I’m pretty sure I won’t be trying it out. UD came out with a new foundation! I’m so here for this! Are those swatches wet still? I’ve heard that this foundation dries down quite a bit darker than when it’s wet- did you think so? They are still wet here and I didn’t notice any difference in color. Without knowing how fair your skin is I really have no idea. Going into Sephora and testing them out is your best bet. I have no idea if any of these shades would work for me but…I’m with you in that I prefer lighter foundation that has a soft finish. When I had acne and acne scarring I loved full coverage. Now that I have dry skin/no acne/no scarring I don’t like wearing anything too heavy on my skin bc I feel like it just doesn’t look good on me. Kinda random but…I’ve been eyeing the new-ish Milk Makeup Sunshine Skin Tint. Milk says it is: preservative free, SPF 30, hydrating ingredients, & sheer/buildable coverage. It looks so glowy and MSBB on the models in the little videos they post. The shade range is really impressive too. I can’t find a review for it though. If you think it looks good I’d love to hear what you think of it!